The agent ( if the privilege is provided ) can add the task to any ticket and assign them to the other agents. It provides the agents the facility to simultaneously work on the same ticket which will improve the first response time and ultimately leads to customer satisfaction. Go to the Ticket List View. Click on the ticket on which you want to add a task. On the left side of each ticket thread, you will notice a More Options icon. Click on that icon and then you will see "Mark for Task" option. After marking the ticket thread, on the right side, you will get Task Creation Form. 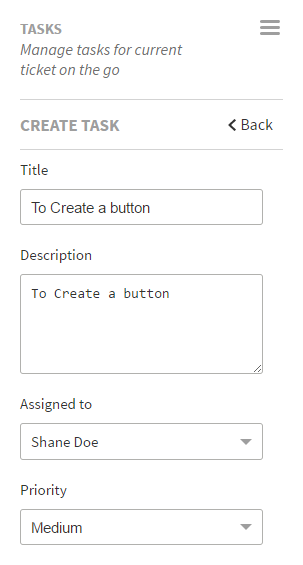 Enter Title, Description, select agent from the drop-down, set its deadline and add an attachment if needed. Hit the "Create" button to create a new task. After the Task is created, you will see the ticket thread for which the task is created. On the left side you will "Linked Ticket" with the ticket number and on clicking that number it will redirect to the main ticket. Other details like TimeStamp, Deadline, Created by, Assigned to, Priority, Stage is displayed on the left side of the task.